The Congressional Research Service (CRS) is a non-partisan agency within the Library of Congress that provides confidential and authoritative analysis on policy issues for Members of Congress and their staff. The CRS has a staff of about 600 employees including policy analysts, economists, scientists, lawyers, and librarians. Following the passage of the Consolidated Appropriations Act of 2018, CRS reports have been made publicly available. 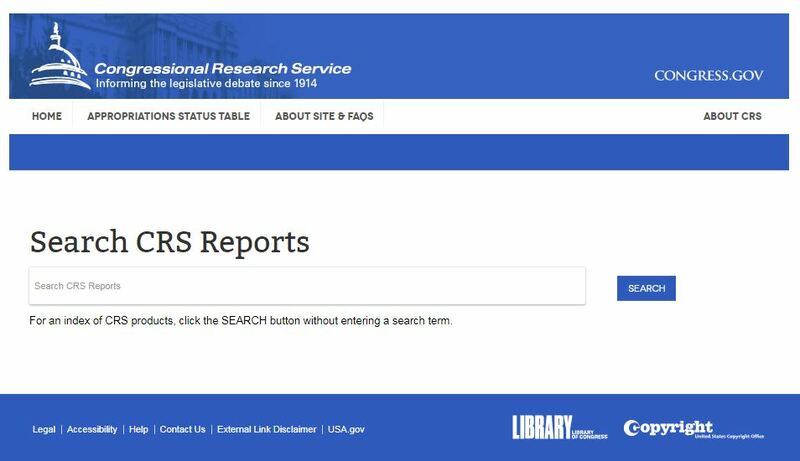 Currently, the official public website provides access to the in-depth “R-series” reports though the full inventory is not slated for full migration to the website until spring 2019, and there is no specified timeline for access to the agency’s shorter written products (Insight, In Focus, Legal Sidebar, etc.). Some publications in the R-series, as well as in the other CRS product series, can also be found on non-official sites including Every CRS Report, and the Federation of American Scientists (FAS) CRS Portal. Economic Effects of the FY2019 Government Shutdown (January 2019) This CRS Insight, written by an Macroeconomic Policy Specialist, provides a brief analysis of the potential economic effects of the current FY2019 shutdown. This entry was posted in CRS Reports, E-Resource, Research and tagged Congressional Research Service, Government Shutdown on January 25, 2019 by Eric Yap.